The question becomes: what IS gravity? What is velocity? Beyond all the mathematics and physics equations, we do not comprehend the source of gravity. No, not the definition of these forces—The Source. If consciousness is a fractal of the wholeness of creation, does it not also fully contain gravity within its totality? What if—humans, who are greater than their mere physicality—are, in fact the source of the forces which bend, distort, and control perceptual time? Science claims that black holes contain what is called an event horizon, a boundary beyond which event cannot affect the observer. The observer (consciousness itself), meets a perceptual barrier which is physically imposed, largely because the observational phenomena is defined by a cognitive model related to the immensity of the black hole. Following simple logic based on the fractal model of consciousness itself, can we presume that when this phenomena is brought into human scale it becomes more manageable? Is the “black hole” simply a larger aspect of the vortex/wormholes that are often localized and reported under other phenomena? 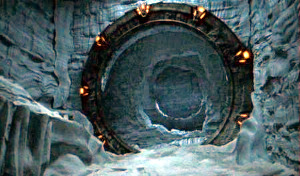 During April 2001 one of the world’s great secrets was revealed: an ancient structure or apparatus that lay encased miles under the hard Antarctic ice was detected by a roving spy satellite. The US military immediately moved to quash the reports and the mainstream news media dutifully complied. A research team of US and UK scientists accidentally came across a mind-numbing discovery. While working on a joint weather research project, the team witnessed the creation of a spinning vortex of time. From the nano-landscapes of the interior consciousness, to the large-scale black holes of space, we are now seeing the evidence mount that dimensionality and time are functions of perception. We are finding it now, because of the “leap” in human consciousness that allows us to see what always existed! This is not an “alien” technology, nor is it “anomalous”. It is the future us revealing things that our limited perceptions could not name, and hence, could not see. I AM: Declaration of Copyright Trademark. a, man: Stephen John : Miller. on I AM: Declaration of Copyright Trademark.